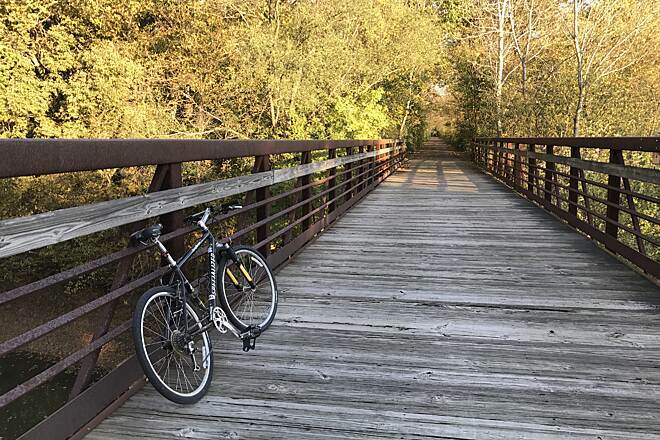 The Lost Bridge Trail, jointly managed by the Springfield Park District and the village of Rochester, is one of the area's earliest and most popular multiuse trails-even for locals taking a weekday break on their lunch hour. 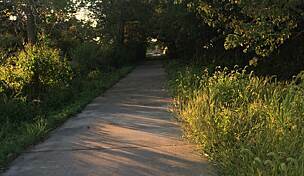 Well-maintained, the trail's starting point is located behind the Illinois Department of Transportation building in Springfield. 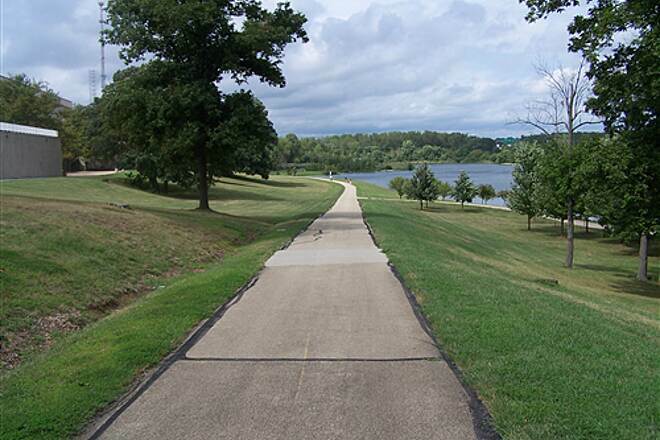 This portion of the trail is not actually on a former rail corridor but wraps partway around a beautifully landscaped and tree-lined lake near the complex. 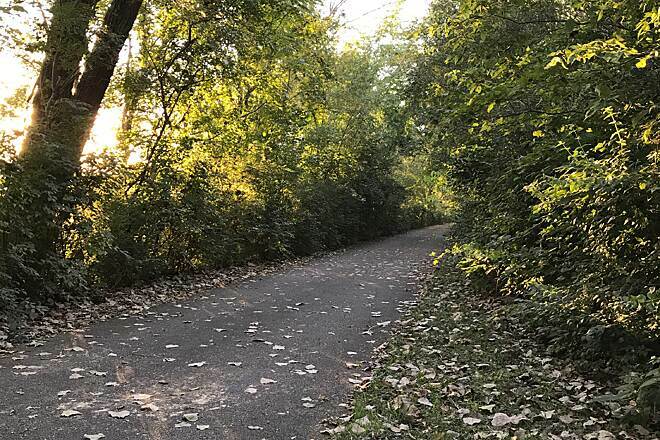 At the lake's northern end, the trail joins the former Baltimore and Ohio Railroad corridor, an obvious change, as the trail becomes straight and flat, traveling through a dense tree canopy. Almost immediately, you reach a clearing and pass under Interstate 55 then plunge back into the forest. The heavy vegetation along the route makes it easy to forget how closely the trail parallels busy State Route 29. 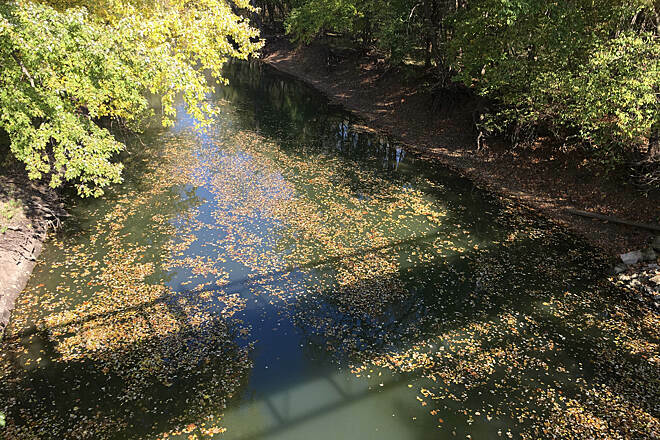 Just beyond a mile from the start, the trail crosses charming Sugar Creek Bridge, which offers great views of Sugar Creek and the lush vegetation hugging its banks. 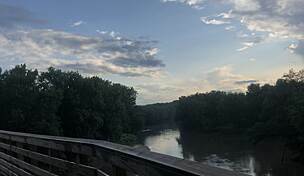 At mile 2, the trail passes beneath Hilltop Road, and at mile 3 it reaches the South Fork Bridge over the South Fork of the Sangamon River. 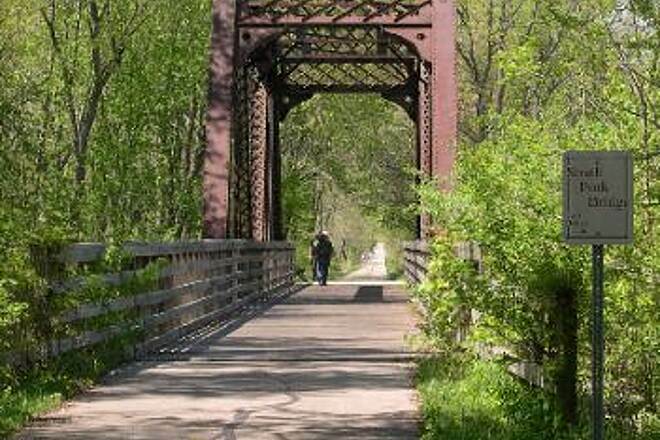 This old trestle-style span is another important remnant of the trail's railroading history; its excellent condition today is evidence of the remarkable engineering and artistry it took to build the structure. After the bridge, look closely for a paved trail connector on the south side that gives you the option of making a quick loop through Rochester Community Park. 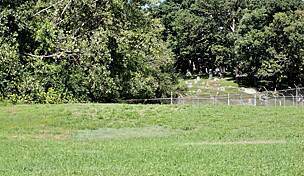 For the final 2 miles after South Fork Bridge to the trail's end in Rochester, you will pass through a short stand of trees before the landscape opens into some beautifully manicured grass fields behind one of Rochester's school facilities. 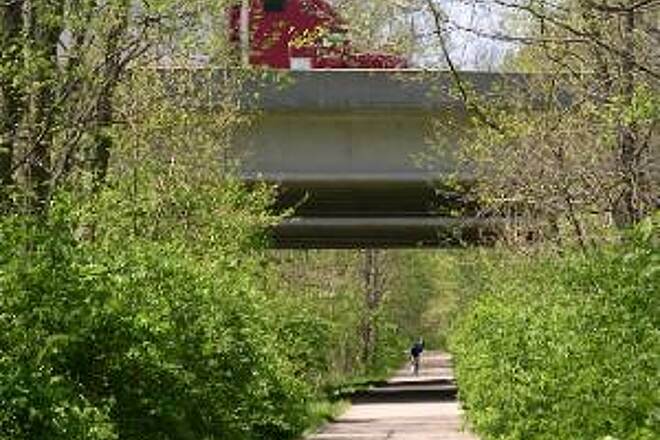 The trail may one day extend southeast from its terminus at Walnut Street to the towns of Taylorville and Pana. 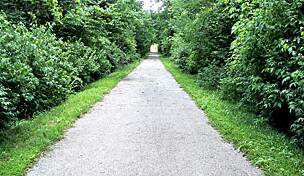 Until then, you must be content to walk, ride, roll, run, skate or ski back to Springfield on this suburban rail-trail gem. To access the Springfield trailhead on Rielly Drive, take Interstate 55 to Route 29 (S. Grand Avenue east) and head west for a half mile. Turn left on S. Dirksen Parkway and go about 1 mile. Turn left on Rielly Drive and look for the trailhead at the far end of the parking lot. To reach the Rochester trailhead, take Interstate 55 to Route 29 (S. Grand Avenue east) and head east for 4 miles. Turn right on Walnut Street and look for the trailhead directly on the right. 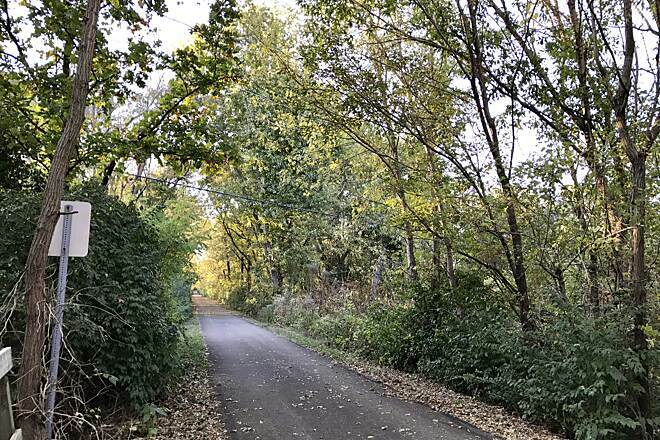 Parking is also available along Wild Rose Lane on the trail spur that travels through Rochester Community Park on the eastern end of the trail. Along our journey to ride the (t)rails ... This was another trail not far from us. Well maintained and highly recommended. Mostly flat with some elevation change on the Springfield end. Pavement is pretty good and smooth as well. The trail is ok. I think at the end of rocket dr & west main. They could use a picnic table or a bench. At that end of the trail their is no place to sit. Rode this trail a couple of times. Nice, but short...only about 6 miles. Trail has a lot of shade which was great when I was riding on a near 100 degree day. Not overly crowded, but not a very wide trail. 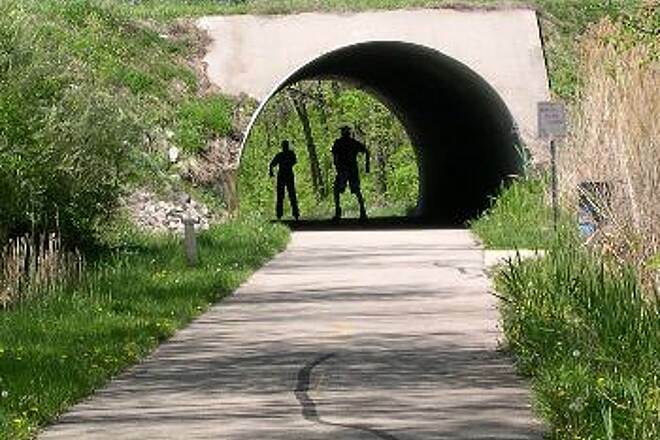 If you are in Springfield for business and want to ride, this is a good trail to ride. ..even after all these years. New: There are nice restrooms now, across W. Main St. from the small Rochester parking lot. Still none at the DOT end. Observation: If the Rochester parking lot is full or you're pulling a trailer, there's a big parking lot at the high school, just across Route 29 at the stop light. 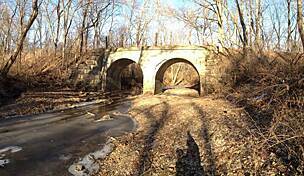 Lost Bridge Trail is a great place to go walking for a couple of hours. The canopy of trees and flora along most of the trail provides good shade on warm, suuny days at any hour. 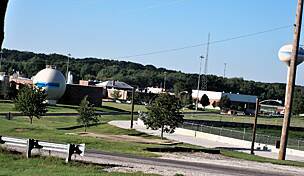 Ample parking is available on the IDOT building grounds for access to the westerly end of the trail. Easy access is also available just off Ill. SR 29 at Hilltop Road, and in the town of Rochester. The vacated raillroad right of way which is the pathway of most of this trail continues southeasterly from Rochester on to Taylorville and Pana. 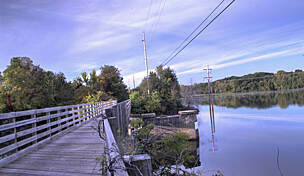 A trail similar to Lost Bridge Trail exists between Pana and Taylorville. 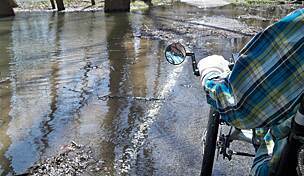 Hopefully, Lost Bridge Trail can be extended on from Rochester to Taylorville. 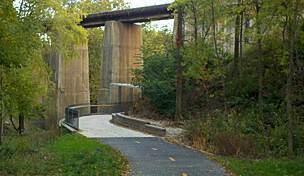 Kudos to those responsible for Lost Bridge Trail and its ongoing maintenance. A real nice short trail. Only one patch on the asphalt the entire 5 miles. Runs close to the road at spots but you would never know it. Not a travel destination for biking but if you are there for all the Lincoln stuff it is well worth it. Many franchise hotels and restaurants about 1.5 miles away. I really like running this trail. Great scenery, well maintained. Thanks. It's a nice trail to ride. 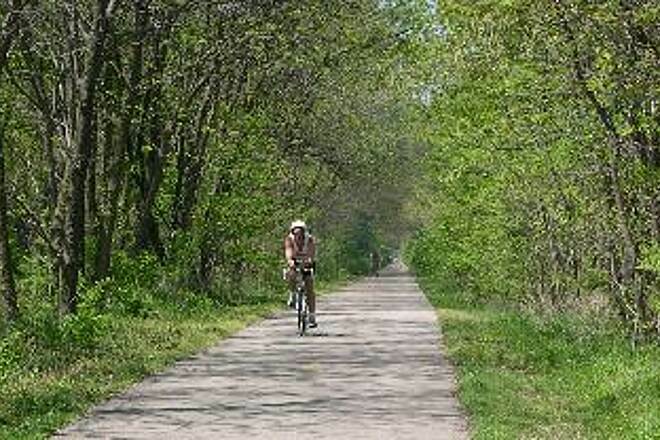 Hope they will get it done between Rochester and Taylorville to hook up with the Lincoln Prairie Trail. Some of where the B+O railroad ran between the towns wasn't touched when putting down HI 29 and some was. A very lovely trail . . . fun to ride . . . only wish it were longer! 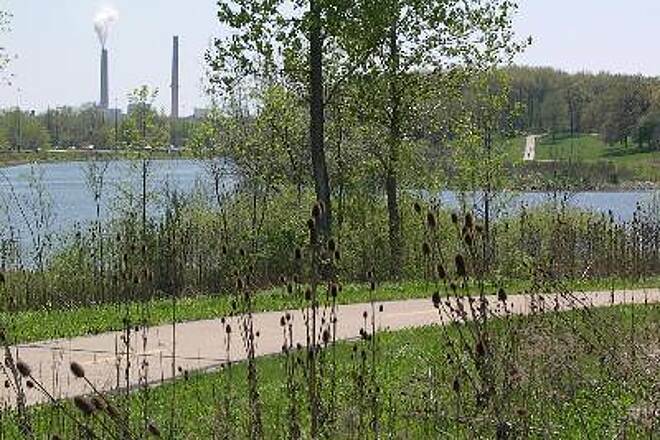 "This is a very nice biking and walking trail that runs from the DOT building in Springfield to the small, but beautiful town of Rochester. 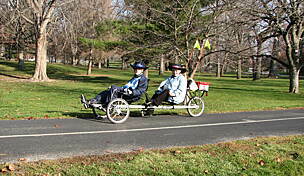 The trail offers great surroundings and lovely landscaping. This is a must if you are in the Springfield and Rochester area." "rode this trail in Aug 2001--a great ride, the trail is well maintained and was a pleasure to ride--lots of diverse users"